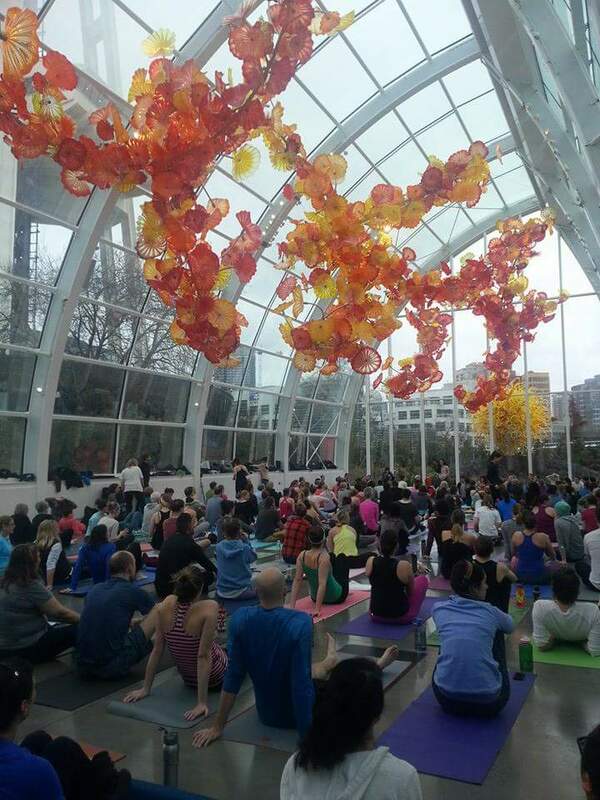 This past weekend we were lucky enough to absorb some of this inner peace by attending a very special yoga class held at the Chihuly Garden and Glass located at the Seattle Center. 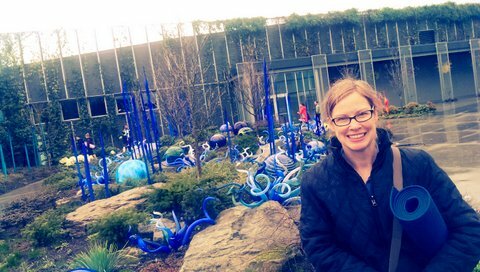 Our friend Melissa was in town visiting, so together we made our way to the Glass House, the centerpiece of the Chihuly Garden and Glass exhibit. 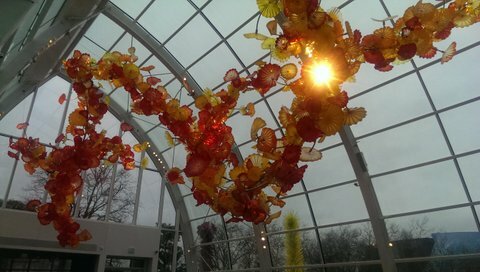 For those of you who have not yet been to the Chihuly Garden and Glass exhibit, it’s a must-see here in Seattle. 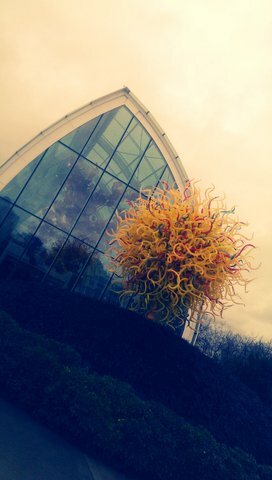 The Glass House is a 40 foot tall structure covering over 4500 square feet of space. 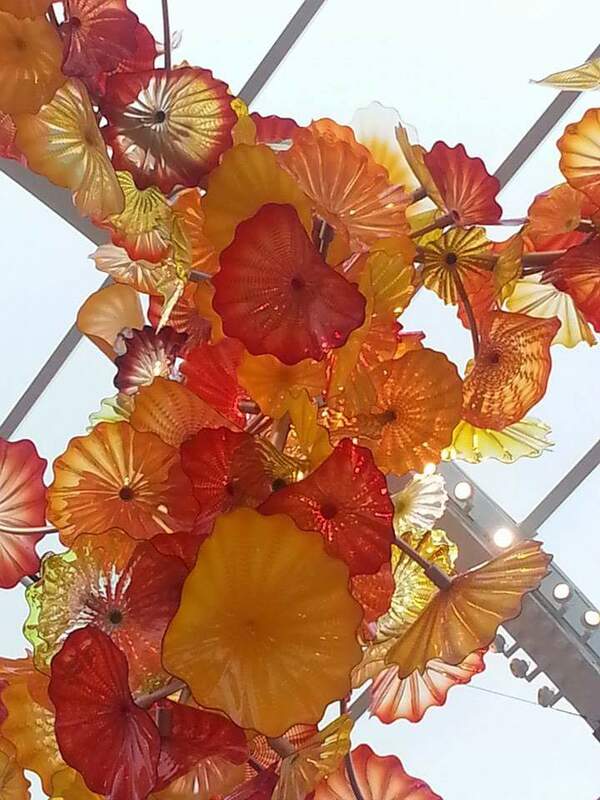 The main installation, which we found is best viewed while laying flat on your yoga mat, is the 100 foot long pallette of flowers suspended from the ceiling, with colors ranging from yellow to red, orange to amber. 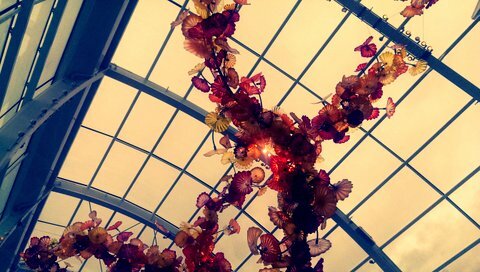 This is one of Chihuly’s largest suspended sculptures and the colors, depending on the natural light and time of day, vary slightly. We were there on a cloudy day with bits of rain and sun and I noticed this change. Or perhaps it was just because my chi was perfectly aligned. We arrived early only to discover that prime yoga mat space was in short supply. 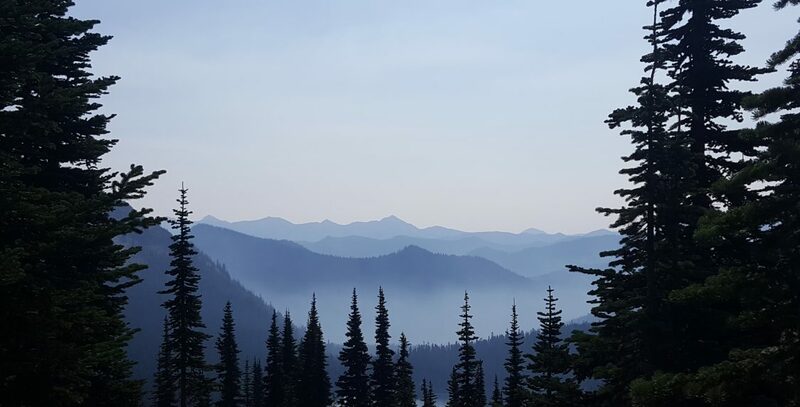 We quickly rolled out our mats and then took in the amazing sites above. 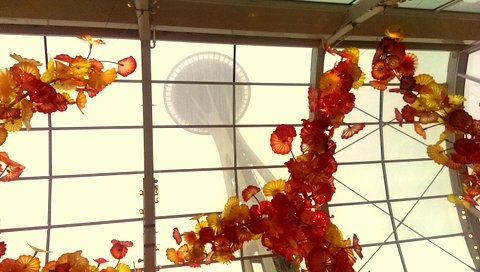 It’s a rare opportunity to be able to lay down on the floor of the Glass House, staring at and through the blown glass, then through the glass structure, only to see above you, the Space Needle, all while not being ushered out by security. 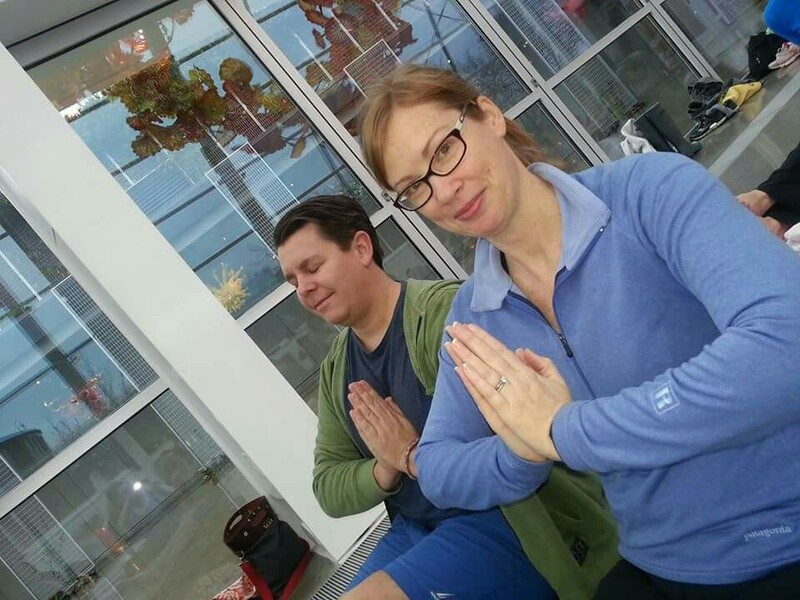 Our Yogi for the day was Michelle from CorePower Yoga. I learned later that Michelle’s studio had recently opened in Lower Queen Anne. Michelle walked around and introduced herself (which I always appreciate) and then she guided us through an hour long yoga session that included numerous poses and a bit of traditional core workout. Michelle was accompanied by what I could only assume were Yogis in training or actual teachers. They quietly walked through class, correcting poses and giving positive feedback, all very zen. 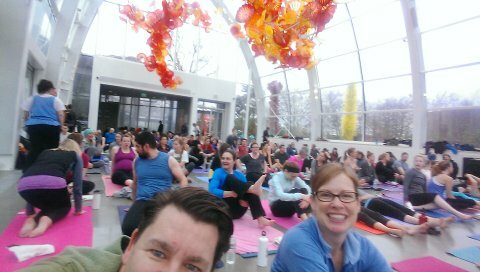 After an hour of Sun Salutations, Warrior Poses, crunches, breathing and inhaling the beauty of both Chihuly and of course, our flawless yoga, we ended. 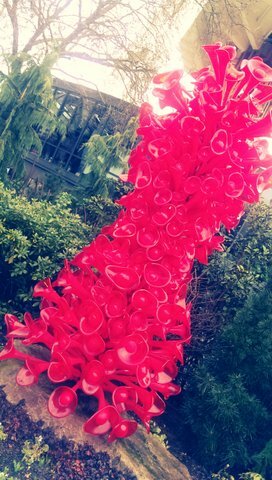 Yoga at the Chihuly Garden and Glass exhibit looks like its going to become a once a month event and tickets go fast. So, we hope to see you there next month.